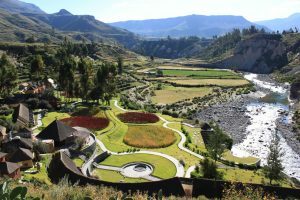 We invite you to enjoy the special energy of one of the most spectacular landscapes in southern Peru: the Colca valley – where the river is united with the sky, the Sun with the Moon, and the mind with the body. 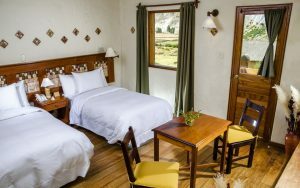 Located at an altitude of 3250 meters (10660 feet) above sea level, at two-and-a-half hours from the city of Arequipa, our hotel is built on the banks of the River Colca and is surrounded by hundreds of pre-Inca agricultural terraces that have been declared a Peruvian National Heritage. 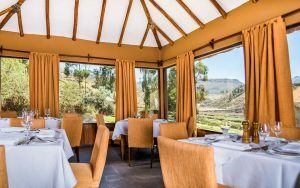 It’s design inspired by the old pre-Inca structures, Colca Lodge employs earth, stone and straw in its construction to create a magical environment where the rooms are connected with the gardens which, in turn, shade into the adjacent crop-fields without the use of dividing structures such as walls or hedges. 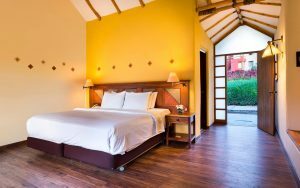 There is full contact with nature without sacrificing the comfort of this rural environment far from civilization – with the exception of Wi-Fi and television, whose moderate use is limited to the area of the bar and relaxation spaces. 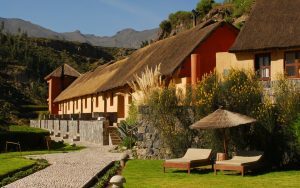 An additional attraction of the privileged location of Colca Lodge is that guests have relaxing thermal springs, unique in Peru, at their permanent disposal. 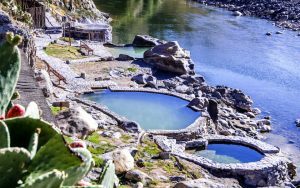 The four pools, which have different temperatures and contain water rich in lithium, are located in completely natural surroundings where the magic of the elements takes on an extraordinary dimension. We should love to receive you as our guest and hope that your stay will be unforgettable.